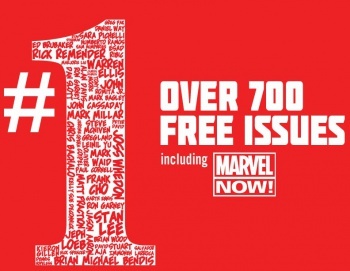 Server overload problems put a damper on Marvel's plans to give away 700 of its #1 comics, so instead the promotion will be pushed back to ensure everyone gets their share. Yesterday we brought you news of a very generous promotion announced by Marvel Comics and Comixology at the recent SXSW festival. The idea was that Marvel would offer up a whopping 700 different #1 issues from its massive catalogue of comic books, spanning the last seven decades or so. Unfortunately, the demand for these free comics was so high and traffic so overwhelming that Comixology (which is normally a very stable, useful comic book reading app) buckled under the strain. Not only was the firm's flagship app unavailable to pull down comics for most users, but the company's website was also unavailable for most of the past two days. Realizing that their generous promotion was rapidly backfiring, Marvel and Comixology have decided to postpone the giveaway until such time as they can come up with some way to hand out these free comics without melting anyone's servers. There's currently no set date on which the giveaway will resume, but Comixology CEO David Steinberger offers hopeful words on the firm's blog. "... we're pausing the Marvel Comics #1 promotion for the time being," Steinberger writes. "For those of you that want to take advantage of the offer - you will get your comics!" Continuing, Steinberger advises anyone interested in updates on this giveaway to fill out this simple form. Presumably that info will then be used to send mass announcements on when and how the free comics can be obtained (but don't blame us if you also receive advertisements -- corporations are jerks that way). As for the rest of you Comixology users; the ones less interested in the free giveaway and more interested in just using the app to read and purchase your comics, there's ambiguously good news on that front as well. Steinberger claims that the Comixology team is working diligently to fix its server issues and recover from the flood of traffic that recently overwhelmed them. As with the giveaway, Steinberger has no solid date on when Comixology will be back up to full strength, but in terms of helpful reassurance, his words are better than nothing. If nothing else we have to give the man propers for coming out to calm the angry masses, despite having no real information to offer them. That takes chutzpah. So basically "We fucked up, we're trying to fix things." It would be nice to get an apology instead of this non-apology, but given that it's "We're trying to give you free comics! ", I think they can be forgiven. I wouldn't say they fucked up so much as they didn't realize people would try to download all 700 at once. I think they thought people would be reasonable and just download a couple at a time. I mean it seems like people were trying to crash the server. Which I guess, this being the internet wouldn't be so surprising. As for how they could fix this. Maybe just limit the download of free comics to five at a time or something. That should help keep major strains of the server, maybe. I don't think people deliberately tried to crash the servers, just that there are more comic fans and aspiring comic fans than anybody expected. Extending the giveaway until the end of march would probably have the effect of slowing down peoples voracious appetites. Telling people they can get free stuff for one day will inevitably make people rush to get it. So I can finally get my hands on Spiderman 2099 at long last?